How to use SMS with Octane AI. With an open rate of more than 95%, SMS messaging is a powerful tool that helps you reach customers instantly. You can use it to send special offers, promotions, promo codes or any other news related to your store. Can I use SMS messaging on my bot? SMS messaging only available right now for Pro plans. If you would like to get early access for SMS, please let us know. How must does SMS messaging cost? SMS messaging is charged based on the number of SMS messages sent from your bot. You don’t get charged for messages your customers send back to your bot. For the Pro plan, one SMS cost $.02 while on the Premium plan one SMS message is $.012. How do I get SMS subscribers? Opt-in through your bot - when someone gives you their phone number during the conversation with your bot in Messenger. Learn more on how to collect phone numbers from your customers in Messenger. 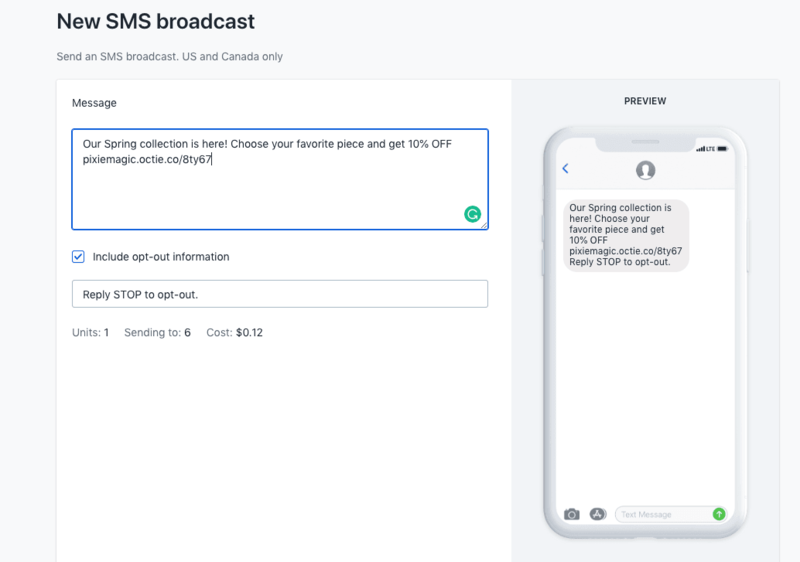 How do I send a broadcast to my SMS subscribers? Note that one SMS message is 160 characters. When you send out a message, more than one SMS message can be combined into a longer message for modern phones as you can see in the preview. Your cost will be based on how many SMS messages you send and you can see it as you type your message. 4. After you’ve created your SMS campaign make sure it will look good for your customers once you send it out. Click on the Preview button, insert your phone number and click Send SMS message button. The preview will be sent to your phone free of charge. 5. Once you make sure everything looks perfect click the Send Message button and your campaign will be sent to all customers who have opted-in for SMS. Do I have to include opt-out text in my SMS message? 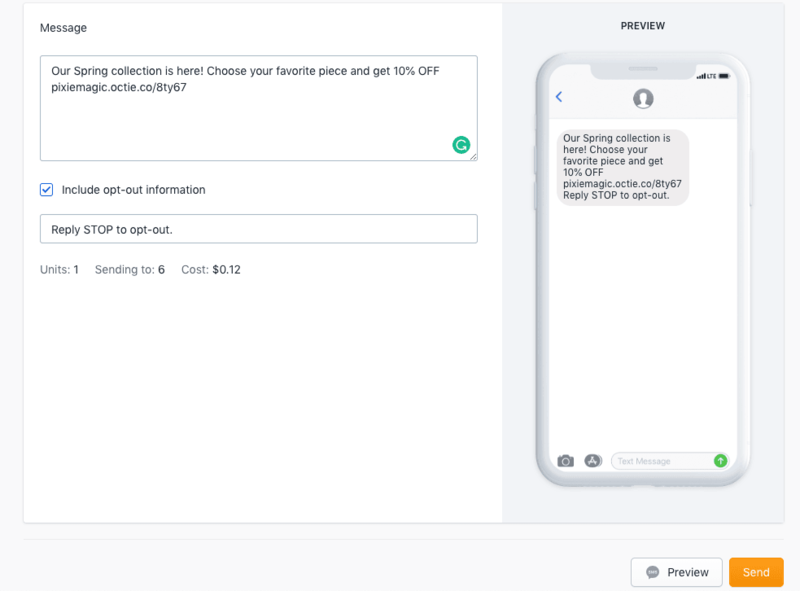 Opt-out information is by default included in every SMS message, so your users understand how they can opt-out if they do not wish to receive promotions on their phone. You can uncheck this box if you do not want to have it included in your message, but we highly recommend to leave it in order to avoid a bad user experience.